J.T.M. Anderson (ca. 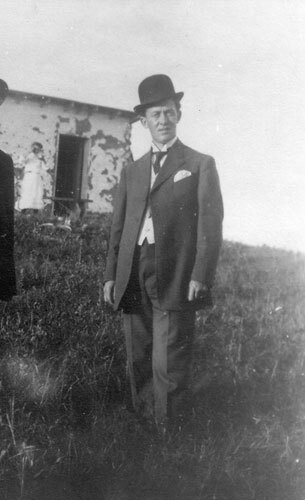 1908) in front of his “bachelor shack” during his early years as a teacher in the province. J.T.M. Anderson was born in Fairbank, Ontario, on July 23, 1878. After graduation he taught for six years in Ontario and migrated to western Canada in 1906. He taught first in Manitoba, then near Melville, and finally at Grenfell. Here he met and married Edith Redgewick with whom he had a son and a daughter. In 1911 he was appointed inspector of schools based in Yorkton, a position he held for seven years. During this time he continued his own Education, earning BA, MA and law degrees from the University of Manitoba and a doctorate in pedagogy from the University of Toronto. In 1918 he published his first and only book, The Education of the New Canadian, and the Martin government brought him to Regina as a director of education, with special responsibility to ensure that school boards and teachers in “ethnic” districts obeyed the law with respect to educating their Children in English. The integrity of the public school system was a principal concern of Anderson, and he might never have turned to politics had he been allowed to remain in his post. He was, however, removed from it in 1922 and his bitterness may explain in part why he listened to the overtures from the provincial Conservative Party two years later. The Conservative Party in Saskatchewan in the early 1920s was in disarray with no leader, only three members in the Legislature, and surpassed in public support by both the Liberals and Progressives. In these circumstances the party turned to Anderson to lead it at its convention in March 1924. Shortly thereafter, the federal party made him its paid organizer in the province, an arrangement which became the norm for most provincial Conservative leaders into the modern era. Anderson did not turn things around for his party immediately; in fact, the Conservatives again won a mere three seats in the 1925 election. Nevertheless, the party emerged from that campaign far stronger than in 1921; Anderson won his seat and the party raised its popular vote considerably. Over the next four years he would receive the help of a new Conservative newspaper in Regina and the co-operation of many of those opposed to the Liberal government. Furthermore, a number of issues arose to split the coalition which had kept the Liberals in power for over two decades. On June 6, 1929, enough voters in Saskatchewan deviated from their traditional voting patterns to bring the Conservatives to power, albeit in coalition. The defensive campaign waged by the Liberals, the presence of the Liberal “machine” and the many scandals attributed to it, and the belief that the government had stagnated after so many years in office all contributed to the Liberal downfall. Also important was the failure of Premier James G. Gardiner to gain control of Saskatchewan’s natural resources, which had been held back by the federal Liberals in 1905. Of even greater significance was Anderson’s tireless effort to ensure that the opposition vote was not split on election day. Right from the time he took on the Conservative leadership he sought the support of every person, group and party committed to the defeat of the Liberals. Eventually the strategy paid dividends. By 1928 he had an agreement with the provincial Progressives not to oppose each other at the next election and further that a “co-operative” government consisting of representatives from all parties would be formed should the Liberals be defeated. Of greatest importance, however, was the sudden appearance of the Ku Klux Klan in Saskatchewan in 1927. Klan speakers charged that the large-scale immigration of people from central and southeastern Europe threatened the province’s Anglo-Canadian way of life; that Roman Catholicism posed a danger to the public school system; and that the Gardiner government had turned a blind eye to both in order to attract the “foreign” vote to the Liberal Party. Anderson stated categorically that neither he nor his party had any formal ties to the Klan, but he did promise to promote additional immigration from Great Britain and to amend the School Act so that no one in religious garb could teach and no religious emblems could be displayed in public schools. Further, he blamed the Liberals for allowing such emotional and divisive matters to become political issues in the first place and his campaign had the desired effect. On election day Liberal representation fell by 50%—to twenty-six seats plus two elected at deferred contests. The Conservatives elected twenty-four, the Progressives five, and six constituencies returned independents opposed to the Liberals. Three months later, after all Opposition members joined to pass a want-of-confidence motion in the Gardiner government, J.T.M. Anderson became Premier. Anderson’s government, which he always referred to as a “co-operative” government, had the misfortune to come to power at the very beginning of the Depression. Although it amended the School Act, established a non-partisan Public Service Commission, passed much-needed Labour Legislation, began an ambitious highway construction program, and concluded an agreement with the Bennett government which brought Saskatchewan’s natural resources under provincial control, as the years went by more and more of its time had to be devoted to attempts to alleviate the worst effects of the Depression. To this end, it created the Saskatchewan Relief Commission to administer the province’s many relief programs, declared a moratorium on sales of land to pay municipal taxes, established the Debt Adjustment Board to mediate between debtors and creditors, tried to protect the wheat Pool, and borrowed from wherever it could to keep farms operational and to maintain minimum standards in the health and education systems. Just the same, none of this saved it at the next election. On June 19, 1934, neither Anderson nor any candidate—Conservative, Progressive or independent—who supported his government won a seat in the Legislature. Thus, in ten years J.T.M. Anderson took his party from the political wilderness to power, himself to the premiership, and both to near oblivion. He deserves credit for the accomplishment, and probably sympathy rather than blame for the defeat. It is most unlikely that anyone, or any set of policies, would have saved any government of Saskatchewan given the impact of the Depression. Anderson resigned as leader of the Conservative party in 1936 but continued to urge co-operation with anyone and everyone opposed to the Liberal Party, a legacy of dubious value to his successors. He went into business from 1936 to 1944, and from 1944 until his death was superintendent of the Provincial School for the Deaf. He died December 28, 1946, and is buried in Saskatoon. Barnhart, Gordon L. (ed.). 2004. Saskatchewan Premiers of the Twentieth Century. Regina: Canadian Plains Research Center.